Stations logged on July 13-14th and November 26th have been heard at Jim's summer cottage in Bromarv in Southwestern Finland with a 200-meter-long wire antenna, and those logged on July 15-22nd at a rented summer cottage in Punkaharju in Eastern Finland, using two 50-meter-long wire antennae. The rest have been heard at my home in Vantaa, next to the capital Helsinki. 576 2.9. 2303 Mega R, Schwerin. Nowadays even with proper IDs, not just non-stop techno as in the beginning. 612 18.2. -1758* R Baltic Waves, Vilnius. v/s Editor-in-chief Siarhiej Shupa. Address: P.O.Box 3245, LT-2013 Vilnius, Lithuania. 666 17,18.7. 2004 R Sombor, Sombor, finally with local programming. 864 5.10. 0320 R Blagoevgrad, Blagoevgrad, strong interference by Egypt. Back to national programming at 0330. This is a tough one to catch, now audible thanks to very auroral conditions - just like the next one. 1035 6.10. 0333 R Regina Banska Bystrica, Banska Bystrica. Back to national programming at 0400. 1071 22.11.. 1610 R Dnepropetrovsk begins local programming at this time. Station name still unclear, but all commercial spots are to this city. Occasionally beating Slovakia in signal strength. 1116 26.11. 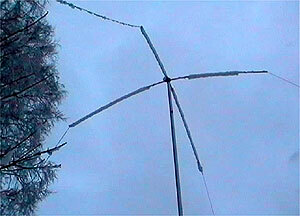 0750 R Blomendaal started with an interval melody, program began at 0800 UTC. 1188 23.9. 1902 R B2 92 news programming and Radio Drina music programming (both in Serbian), transmitter site later confirmed as Marcali, Hungary. However, others still suspect that this might be the mothballed TX site at Szolnok. Anyhow, after a few days with Yugoslav stations, the frequency has been used by the IBB. When I first heard the station, telephone numbers for ANEM, the Independent Media Association were announced within both programs, so - on the eve of the interesting elections - this seems to be an operation of the Yugoslav opposition, combining various FM sources. Radio B2 92 was said to broadcast on 89.2 and 93.0 MHz, and Radio Drina on 93 MHz. 1233 5.11. 0206 R Trafic, Rocourt. Also audible on 1125, but weaker. 1350 6.10. 0355 R Gy�r, Gy�r. Strong, but unfortunately no sign of R Szolnok. 1350 25.10. 0355 R Szolnok, for once this one was audible. 10940.5 6.8. 1720 AFRTS Sigonella, Sicily. On USB. The address for reports is the Naval Media Center, NDW Anacostia Annex, 2713 Mitscher Road, SW, Washington, DC 20373-5819. 11690 5.8. *0903- Scandinavian Weekend R, Virrat. The station was audible by groundwave only as far as 5 kilometers away from the 50-watt transmitter. So this one had to be picked up just around the corner... during the Finnish DX Association summer meeting. The skip would enable it to be heard in Central Europe, but not in Southern Finland. 11720 5.8. -0903* Scandinavian Weekend R, Virrat. 1080 8.2. 2258 R Granada, Granada. Only the more common R Huesca and R Coru�a during the following break at 2338. 5985 16.7. -2153* RTV Congolaise, Brazzaville. 873 28.10. 2238 BSKSA Qassim. AIR Jalandhar was heard signing on in the background. 1089 21.7. 2010 BSKSA 2nd program, from an unknown transmitter site. A native speaker - thanks to the help of Jean Burnell - has confirmed the identity of this unlisted station. It may be that Qurayyat from 1098 kHz has switched here. 1205.67 20.7. 2003 R Payam (= Message) from Iran. This is one of the national networks of IRIB. Transmitter site is unknown. Strong signal. 1341 16.7. 1949 R Kuwait. Who knows if the present QTH is the same as before the Gulf war (Magwa back then)? 1557 5.9. 1728 Family R, Taiwan, in English at this time. 4319 16.8. 1850 AFRTS Diego Garcia. USB. 10320 22.11. 0400 AFRTS Hawaii. 13362 26.9. 1459 AFRTS Barrigada, Guam. 1630 29.4. 0110 R 1630 "Buen Ayre" Buenos Aires, ID also as "La Red 92"
3234.87 28.8. -0301* R Luz y Sonido, Hu�nuco. 3325.02 20.7. 0155 UNID Brazilian IDing as "R Gazeta 890", so is this Super R Tupi relaying R Gazeta? 3375 20.7. 0003 tent. R Dourados, Dourados MS. I missed the name, but calls given in the ID match WRTH info, 720 is the AM-fq. 3494v 18.7. -0156* R Padilla, Padilla. The station is drifting all the time, logged on several nights. Usually the frequency is roughly 3493.75 kHz around 2345 when the signal becomes audible. For instance on July 18th, the station signed off at 0156 UTC, and by that time had drifted up to 3494.28 kHz. Time anns 4 min ahead. 4716.78 30.4. 2336 R Yura, Yura, "La Voz de los Ayllus"
4865 19.7. 2319 UNID Brazilian with LBV-programming. Is this R Miss�es da Amaz�nia, Obidos PA, or what? 4885 19.7. 2333 R Difusora Acreana, Rio Branco AC. Also R Clube do Par�, Bel�m PA, identified. 4935.03 19.7. 0225 R Capixaba, Vit�ria ES, with Spanish-language segments in the program "A hora de ouvinte" ("La hora del oyente"). -0210* Radiodifusora Huancabamba, Huancabamba, has returned to its old frequency. First noted on July 17, signing off at 0100. 6672.96 11.7. 0030 R Andina, Huancabamba. On July 22nd 2000 in the program "Amanecer Andino" they read my letter on the air, and also promised to reply by mail "soon". I'm still waiting... Lectura de mi carta was caught on the air by Colombian DXer Rafael Rodriguez R., who kindly sent me a recording of what he heard. Here are two excerpts; the first one is what the announcer told before reading my long letter, the second includes his comments after the letter. 8759 16.8. -0256* UNID station in USB only, likely from Chile. CBV Playa Ancha Radio has been logged here previously with R Portales programming.